Are you using an old, inefficient air conditioner or window units to cool your home? If so, consider an air conditioning upgrade from Air Inc. Heating and Air Conditioning. We install highly efficient, effective air conditioning systems that will keep your home more comfortable and reduce your heating and cooling costs. Call us today at 1-844-359-5454 or click below to get a free estimate on air conditioning installation for your home! We offer a variety of AC systems that can provide the comfort and efficiency you need for your home. We provide complete air conditioning replacement and new system installation in Branford, North Haven, Guilford, and the nearby areas. More comfortable home: No one wants to deal with an uncomfortably hot home. An air conditioning system is a smart solution to this problem, and a central or ductless system will be far more effective than window units. What's more, the installation of these systems will raise your home's resale value. If your home already has a central air conditioning system, checking the SEER rating will help you understand the efficiency. Upgrading to a modern unit often brings energy savings because newer units provide such high efficiency. For homeowners without an AC system, whether a central or ductless system is best is often determined by your existing ductwork and your budget. If you're interested in installing a new air conditioning system in your home or replacing your existing one, the experts at Air Inc. Heating and Air Conditioning are here to help. Our complete air conditioning installation services will help you create a more comfortable, efficient home. Call us today at 1-844-359-5454 or contact us online to get a free estimate on air conditioning replacement or installation for your home. 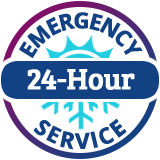 We offer all our services in Branford, North Haven, Guilford, East Haven, Madison, New Haven, Hamden, West Haven, Milford, Woodbridge, and throughout the surrounding areas.